At Risk Intervention (ARI), a short-term shelter, also known as the “Waystation,” in Knoxville, is one of two recipients of our 2018 capital improvement funds. They have been instrumental in helping thousands of animals over the last decade by serving as a “stop-over” for animals in rescue. Sometimes they go to ARI for an overnight stay, and sometimes they stay for a few weeks while they await a northbound transport, or when they are in need of confinement following treatment for injury or illness. ARI also sometimes serves as a pulling rescue from local shelters. Because they have been asked to take in several large breeds lately, they found themselves in need of some bigger kennels, so they asked for our help. We had the honor of purchasing two 10x6x5-foot kennels for the Waystation, as well as four additional gates, which enable them to divide the 10×5-foot runs into 5×5-foot runs when they need to house more dogs. The total cost for these items was $1020. Pearson, a mid-age English Shepherd mix, was pulled from a high-kill shelter by At Risk Intervention (ARI). He would have eventually died of heartworms anyway if ARI hadn’t stepped up to help. When they reached out to us requesting sponsorship, we couldn’t say no. We paid $300 toward his medical costs. Pearson is worth it! Minnie was hit by a car and sustained a broken jaw and palate. Her owners took her to a local vet to be euthanized because they couldn’t afford the required surgical repair. The vet just couldn’t do it with Minnie standing there wagging her tail with blood pouring from her mouth. She asked the owners to surrender Minnie so that rescue could step in. At Risk Intervention (ARI) intervened!!! They took Minnie under their wing, set up an appointment with a surgical specialist, and got Minnie taken care of ASAP! ARI called on us to help sponsor the large surgery bill. We kicked in $300. Once she’s healed, Minnie will be sent to a northern Lab rescue where she will find an excellent home. Lovely little Lesa is a 48lb red tick hound who can’t stop smiling and wiggling. Yep, a full front teeth smile when she first meets you! She’s a total sweetheart. 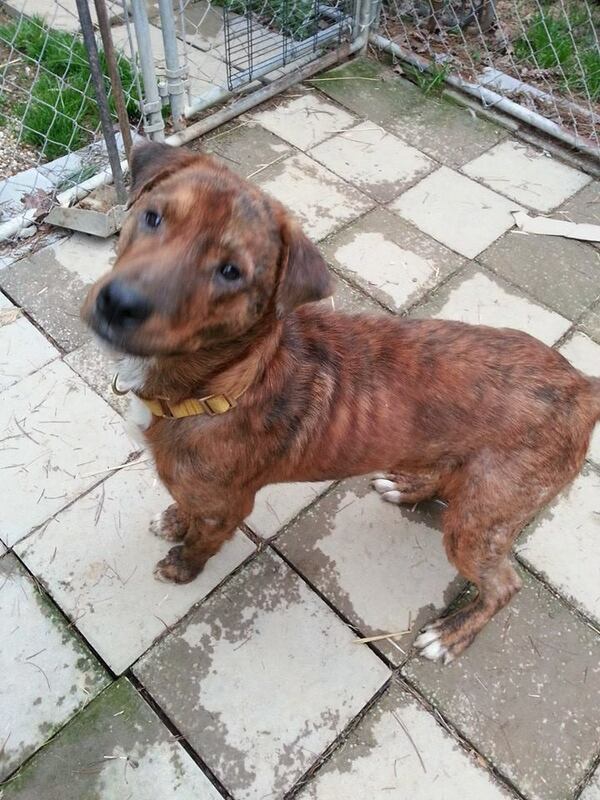 Lesa was pulled from a kill shelter for At Risk Intervention (ARI), and she has heartworms. She was spayed and vaccinated, and now she’s ready for her heartworm treatment. HPAN sponsored $300 of the cost. At Risk Intervention (ARI) serves as a short-term shelter, called the Waystation, for dogs that are in transit to rescues, for dogs that need to be out of the regular shelter environment for 14 days prior to going into rescue, and even for heartworm-positive dogs who need 6-8 weeks of post-treatment rest. Without ARI, many dogs wouldn’t even have the chance at life. When they requested two additional kennels for their operation, we were happy to sponsor their need. We have seen firsthand the great work they do. At Risk Intervention (ARI) acquired Michael the Beagle mix. He is 35 lbs of white and blonde love whose appetite almost got him killed. Michael’s mission in life is to eat. Unfortunately, that earned him a coyote trap clamped around his front paw. Michael was found trapped, and he was freed and turned into the shelter. When he turned out to be heartworm positive, he was placed on the euthanasia list. Fortunately, his wonderful personality rallied the volunteers, and they convinced ARI to take him. They couldn’t say no when everyone chipped in to pay for his shots and neuter. HPAN paid the $230 fee for Michael’s treatment. At Risk Intervention (ARI), a local non-profit, operates what they call the “Waystation,” which is a short-term rescue for at-risk dogs. The dogs stay at the Waystation until they can be transported to a breed rescue or other rescue. The Waystation often has a dozen or so dogs in their space. They reached out to us to help them purchase some rubber mats for their kennels. The mats are necessary to insulate from drafts and prevent debris from getting wedged in the cracks. Because the mats are black, they also retain heat, keeping the area warmed and preventing water from freezing in most temperatures. One 6×4 and one 4×4 stall mat are needed for each kennel, and each kennel is responsible for saving around 36 dogs per year, since an average dog’s stay is 10 days. They needed, and we bought seven mats for a total of $185. Yes, we’d say this was a worthy investment! At Risk Intervention (ARI, Inc.) took in three cruelty case hounds for rehab. We sponsored the following services: rabies and Bordetella vaccines, parasite checks, flea/tick/heartworm prevention (one dose), and health certificates. Once they are healthy and whole again, they will be available for adoption through rescue. Buster and Rascal were abandoned in a rural area and left alone on a Morgan County Tennessee property after the owners were evicted. They were found living under the abandoned house. They are reportedly the only ones left from a litter, the others having succumbed to starvation or coyotes. At Risk Intervention (ARI) took the dogs in and asked us to help cover their exams, vaccines, testing, and neuters. ARI covered their deworming, microchips, and flea/tick/heartworm prevention. Now, they are on their way to Great Pyrenees rescues! At Risk Intervention (ARI) is instrumental in providing a safe stop-over for animal transports coming through East Tennessee. They are well-known in the rescue community for their multifaceted efforts. Occasionally, they take in a dog who would be eligible for transport with a little medical care. They reached out to us to help with Jordan, who was slated to go north, but can’t now that he is heartworm-positive. Their goal is to help him get well and have him neutered so he will be ready to live out the rest of his life. He is only a year and a half old, so he deserves this chance. We sent $330 to ARI to help with costs for Jordan.